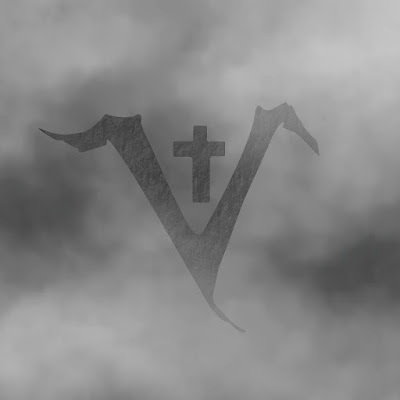 The godfathers of American doom metal SAINT VITUS are going to release their 9th full-length album, "Saint Vitus", on May 17, 2019. 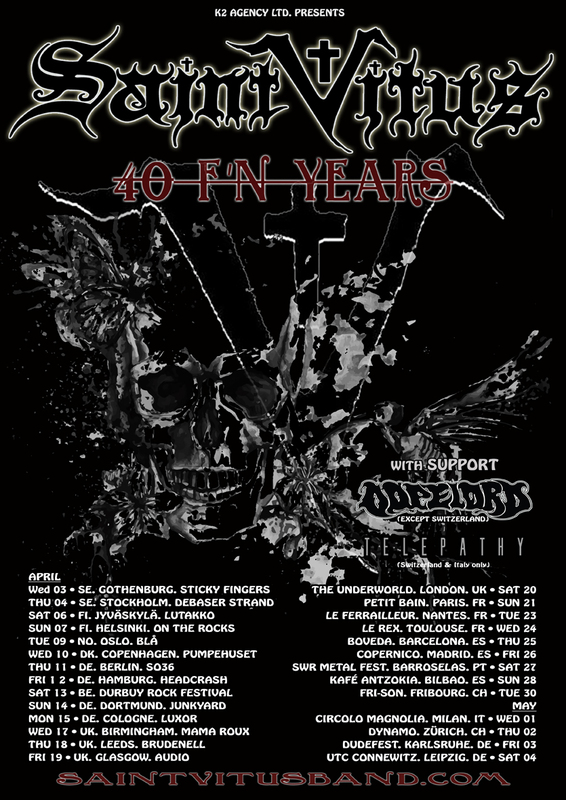 SAINT VITUS kick off their Anniversary European Tour on April 3rd in Gothenburg (Sweden). A full list of confirmed shows for the "40 F'N Years" trek can be found below. The band will be supported by DOPELORD. The already legendary story of SAINT VITUS began in the year 1978, when guitarist Dave Chandler, together with Armando Acosta on drums and bass player Mark Adams, started rehearsing. After trying out two other singers, the band finally settled for vocalist Scott Reagers under the designation TYRANT. In August 1979 the quartet played their first show and in 1980 their name was finally changed to SAINT VITUS. Reportedly this move was inspired by the BLACK SABBATH song "St. Vitus' Dance", taken from the “Volume 4” album (1972). The eponymous debut album "Saint Vitus" had been released in the same year and was quickly followed by the second full-length "Hallow's Victim" (1985) and an EP entitled "The Walking Dead" (1985). With Thrash Metal on a furious rise, the ultra-heavy sound of SAINT VITUS was mainly enjoyed by connoisseurs of Doom and a dedicated underground following. This might have been one of the reasons for Scott Reagers to part from the band in 1986. 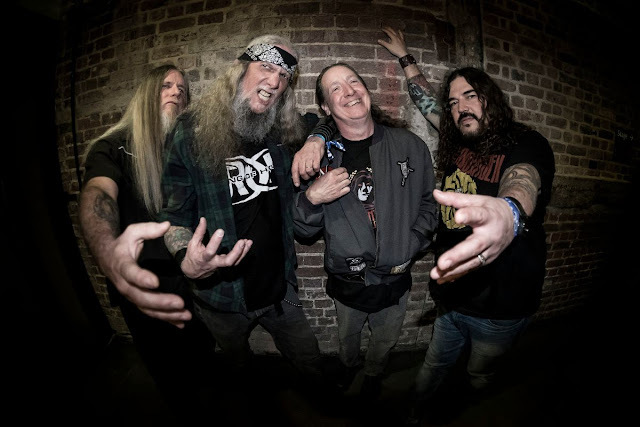 His unexpected move turned out to be hardly a problem for the band as they recruited Scott "Wino" Weinrich from THE OBSESSED, who is considered as the ultimate voice of SAINT VITUS by a clear majority of their adherents. When Scott Reagers left, Dave Chandler had already written most of "Born Too Late" (1986). This album gained the Americans growing attention in the Metal underground especially overseas. The anthemic title track is considered be one of the great Doom hymns by many fans. The EP "Thirsty and Miserable" (1987) followed, which featured a BLACK FLAG cover version of the same name, but "Mournful Cries" (1988) was still going to be the last album for SST Records. All this hard work during the previous years started to pay off. With their aptly named fifth full-length "V" (1989) now released on the famous German Doom label Hellhound Records and the live recording "Live" coming out a year later, interest started to grow considerably, although at first in continental Europe, but soon after in England as well. Just as the horizon was brightening for the Godfathers of Doom, Wino decided to leave SAINT VITUS and reform THE OBSESSED in 1990, which turned out to be a serious blow. Wino was first replaced by Christian Lindersson from Swedish musical and spiritual brothers COUNT RAVEN. With him at the microphone SAINT VITUS recorded "C.O.D." (1992), which was produced by Don Dokken and gained high critical acclaim. Despite the warm welcome received, the band remained largely inactive after this release. Two years later, SAINT VITUS reunited with their original singer Scott Reagers. This led to the again much applauded album "Die Healing" (1995). It might have been the right time for the group to reap the harvest of all the amazing songs that they had sown, but due to severe health problems of Scott Reagers their European tour had to be prematurely ended and that seemed to be the end of the SAINT VITUS story for a long time, much to the dismay of their loyal and by then many followers. At the time nobody could have foreseen that April 29th, 2009 in Stuttgart, Germany would mark Armando Acosta’s final performance with SAINT VITUS. After this last show in Europe the band returned to the States as planned. There Amando’s multiple serious health issues were continuing to take their toll on him, and with great sadness on November 25th, 2010 SAINT VITUS received the painful news that their longtime friend and band mate had passed away. When SAINT VITUS played their massive show at Hellfest in France, the crowd witnessed a new member on the drum stool. Henry Vasquez, who had already joined Dave Chandler on his project DEBRIS INC. made his debut there and remained with the band from that day on. In 2012, SAINT VITUS signed to Season of Mist, who proudly released "Lillie: F-65" in April. Seventeen years after their previous album and nine years after their reunion, SAINT VITUS were returning with a masterpiece that cemented their status as true icons of Doom. "Lillie: F-65" includes the trademark song writing style so beloved by SAINT VITUS fans: there is the cataclysmic and unmistakable guitar sound of co-founder Dave Chandler full of reverbs, feedbacks, flanger and apocalyptic distortion leading to amazing and magical solos. "Lillie: F-65" is furthermore graced with the deeply resonant vocals of Scott "Wino" Weinrich who had rejoined the fold to record an album with the band for the first time since the glorious "V" (1989) and whom many consider to be the classic SAINT VITUS vocalist. From the very first guitar chords, that unmistakable frying, sizzling, and wailing signature sound of Dave Chandler, any adherent of classic doom metal will immediately know: this is SAINT VITUS. 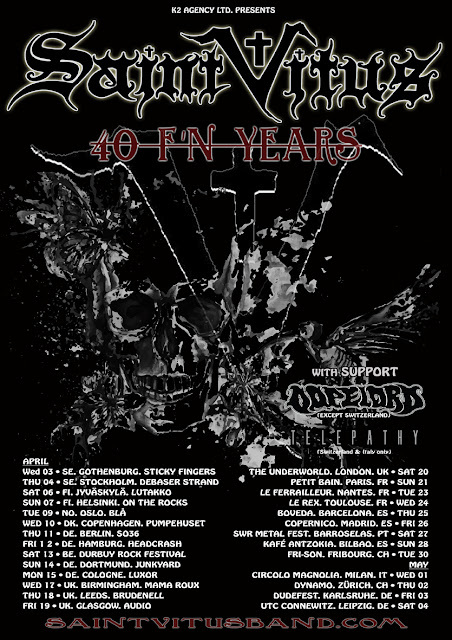 The godfathers of American Doom Metal will soon embark on an extensive European tour in celebration of their 40th band anniversary. At first glance a bold statement such as "godfathers of American Doom Metal" might appear to be weighing as heavy as this band sounds. Nonetheless this is simply the truth in this case.